The first of two running events that take place among the majestic redwood forests of California’s Humboldt Redwoods State Park (October’s Humboldt Redwoods Marathon & Half Marathon is the other), the Avenue of the Giants Marathon, Half Marathon & 10K offers much of the same breathtaking scenery as its autumn counterpart, along a course once described by Runner’s World as one of the nation’s most beautiful running routes. From the starting and finish line at the park’s Dyersville Bridge on Bull Creek Road, the out-and-back course for the half marathon follows the second out-and-back of the 26.2-mile race, heading south along the Avenue of the Giants (Highway 254), all the way along six and a half miles of paved roads to the turnaround point near Hammond Grove and Truss Creek, where runners then make the turn and retrace their steps back toward the start. All along the course, which starts out flat for roughly the first mile and then becomes hillier and more challenging as runners move into the middle miles of the race, the scenery changes from a mix of redwoods to wide open spaces. There, you can get a glimpse of the majesty of the surrounding mountains, and back again to canopies of redwoods overhead. Organizers say that even in the non-shaded portions of the course, the elevation and the season of year combine to provide cool temperatures in most years along the entire race course. Runners will encounter three aid stations along the course and should expect a course that climbs gradually but steadily over the first half of the race, and then descends slowly and steadily along the second half of the race to the finish line at the Dyersville Bridge. More than 2,400 runners come out to take part in all three races combined most years, including more than 1,300 runners in the half marathon alone. Runners in the half marathon will have a course time limit of 6 hours, which means they’ll need to finish their race no later than 2:45 PM. Located on the eastern edge of Northern California’s Humboldt Redwoods State Park, which lies about a 4 1/2-hour drive up the coast from San Francisco, Weott typically sees somewhat warmer and drier weather in the late spring than the early spring, when temperatures can dip into the 30s. On race day (May 5), the average low is 44ºF and the average high is 62ºF. See the race route map for the Avenue of the Giants Half Marathon here. To reserve your spot in the 2019 running of Weott’s Avenue of the Giants Marathon, Half Marathon or 10K race, register online at Enmotive.com here. 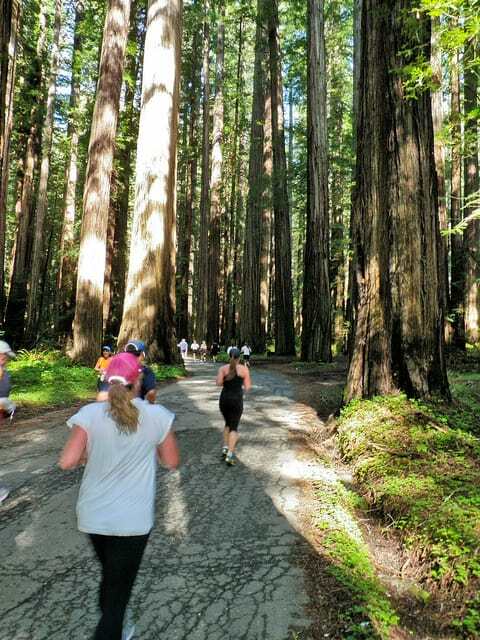 Ever run in the Avenue of the Giants Half Marathon? Share your impressions here, or post your review in the Comments below.